Hydergine Benefits | Does Hydergine Increase Brain Power? Hydergine (generic: ergoloid mesylates), whose chemical name is dihydroergotoxine mesylate, is an FDA-approved drug used to aid in the treatment of older individuals showing signs of neurodegenerative disease. It is thought to have both neuroprotective (protective of the brain cells) and nootropic effects. The active ingredients of Hydergine are known as ergot alkaloids or ergoloids (specifically dihydroergocristine, dihydroergotamine, and beta-dihydroergocryptine) and derived from ergot, which is a type of fungus known to grow on rye. These ergoloids act as neuroprotective antioxidants though their exact mechanism of action is still unknown. Recent studies suggest that Hydergine modulates synaptic neurotransmission although it was once believed to only increase blood flow to the brain. Have a positive effect on mental alertness. Improve the metabolic process of neurons and as a result, induce higher cognitive function. Aid in recovery from a stroke. 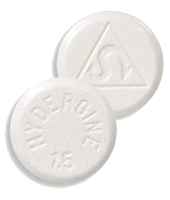 Most persons prescribed Hydergine experience little in the way of serious side effects. Some minor effects that were reported include: nasal congestion, nausea and gastric problems (these effects may be reduced if the medication is taken with food), an allergic reaction of the skin, headache, or blurred vision. Inform your doctor if you are pregnant or nursing, have a hepatic illness, suffer from alcoholism, are epileptic, or are taking medicines for the treatment of hypertension. Hydergine should not be prescribed unless the patient is free from psychoses of any etiology (abnormal conditions of the mind/psychological disorders). How Does Hydergine Improve Brain Function? Hydergine is thought to have nootropic effects, although studies do not yet confirm if this applies to healthy adults or simply those suffering from neurodegenerative conditions. At the very least, the antioxidants contained within provide a level of protection from free radicals. Although it is a prescription drug, some sites market it as a cognitive supplement without a prescription. Consult your doctor before deciding to begin a regimen of Hydergine and be wary of websites that do not require a prescription for the drug. For more information on brain power-enhancing supplements that are available legitimately without a prescription, check our top supplements chart.